“It is … hard to think that [James] Buchanan has any serious competitor for being the worst president of the United States.” So writes journalist Robert Strauss in the first chapter of “Worst. President. Ever. : James Buchanan, the POTUS Rating Game, and the Legacy of the Least of the Lesser Presidents” (Lyons Press), his recent presidential biography about the fifteenth president of the United States. Ironically, Buchanan was seemingly qualified to be president: he was a longtime member of the House of Representatives, minister to Russia under President Andrew Jackson, a United States senator for more than a decade, and secretary of state under President James Polk. In practice, though, Buchanan was awful. “Whatever Buchanan did always seemed to backfire, even if it should not have touched him,” notes Strauss, who recently spoke to Failure about why Buchanan was so incompetent. And so unpopular that he was the first president to be offered personal security after leaving office. What was James Buchanan like? What did he look like? How did he come across to people? He was tall for his time—about six feet tall—and he had a couple of odd physical features. He didn’t have body hair or facial hair, and he had one eye that was far-sighted and one that was near-sighted. So he would often come close to people to see them, which made people feel like he was really interested in what they were saying. He also was apparently a good friend and a good fellow. But some people are just not suited for the things they do and he was not suited to be president. I’ll ask you a question you ask in the book. Why the lack of interest and knowledge of Buchanan? The idea of the American presidential biography didn’t really come about until the 1950s. All the great biographies that you read in school are relatively modern. And just like anything else, biographers have chosen the greats [to write about]: Washington, Lincoln, Roosevelt. One of the reasons David McCullough is so popular is John Adams and Harry Truman. Neither had a substantial biography until the 1980s or ’90s. So there’s been a lack of interest in almost everybody [except the greats]. Buchanan is no different than Franklin Pierce or Martin Van Buren. Why haven’t historians wanted to write about the failed presidents. Can’t we learn from their missteps? It appears not many people want to visit his birthplace—or Wheatland—at least as compared to Mount Vernon or Monticello. I wouldn’t say most people don’t want to. His birthplace is just out of the way, [marked by] a little obelisk in the middle of nowhere. Wheatland is in a substantial town—Lancaster, Pennsylvania. It was the largest inland city in the United States at the time. It’s 60 miles west of Philadelphia in Amish country and Franklin & Marshall University is there. It’s not an unsubstantial town, but when people go to presidential sites it’s Mount Vernon, Monticello, Hyde Park, or maybe the Nixon Library. On to his presidency itself: How did Buchanan intercede in the Dred Scott case—and put himself on the road to being the Worst. President. Ever? That’s the start of things. He was a strict constructionalist—or whatever you want to call him—but he didn’t believe in the separation of powers at the beginning. His big goal was to settle the question of slavery; it was the great American question. He met with Roger Taney, the Supreme Court Chief Justice. I always say that Dickinson College started the Civil War as both Buchanan and Taney went to Dickinson College. Both saw the Dred Scott case winding through the courts and Buchanan said, in effect, If it’s going to be a 5-4 decision, southerners vs. northerners on the Supreme Court, it’s not going to be much of a decision. If you want this to be a decision you’ve got to convince some northern justices to go along with it—and [Taney] did. So his meddling got the case heard, and of course, Taney being a slaveholder who was from Maryland, he wrote this horrendous decision, essentially nullifying the fugitive slave law and the Compromise of 1850 and everything that had been done to compromise on slavery throughout the previous decades. Now basically every state was a slave state. He solved the question in the most negative of ways. What was the problem with Buchanan’s cabinet? From reading your book, it sounds as if they were a bunch of yes-men, who wouldn’t tell Buchanan when he was off course. Correct. Cabinets are like that in a lot of ways. Trump didn’t put Elizabeth Warren in his cabinet, right? But Buchanan was a southern-leaning man—he was called a doughface, for being a southern-leaning northerner. He lived in Washington for a long time and Washington was a southern city, so many of his friends were southerners and that was who he put in his cabinet. So it’s not so much that they were “yes men.” He was used to their ideas. How did Buchanan precipitate the Panic of 1857? I would ascribe it to the Dred Scott decision. Let’s say you were doing okay in the north and you have this tin cup factory in Lancaster, Pennsylvania. It’s going well and you’re going to expand and go down the road to Harrisburg. But now there’s a tin cup factory in Maryland, not far away. Who is to say that factory is not going to use slave labor? How are you going to compete with that? So commerce sort of stopped and that led to a big panic, precipitating other businesses to fail and New York banks to close. People said, You should be more like the southerners, who can feed and clothe themselves with their farms. Southerners didn’t use banks quite as much, at least not in a speculative way. That exacerbated the downslide, pitted north against the south even more than it was, and northerners really started to blame Buchanan for their troubles. Can you identify any positives from his time in office? There were some positive developments during his time in office; the first transatlantic cable was completed, for instance. Yeah, the first transatlantic cable, and during his time the Japanese first came over and were greeted in Washington; that’s a positive, I suppose. Many of his positives were things that didn’t happen, like buying Cuba and making it a slave state. He promulgated more wars against more countries than any other president, including backing wars in Nicaragua and Paraguay and Honduras. One of the most interesting bits in the book is how you note that Buchanan was so unpopular at the end of his term that he started the trend—for lack of a better word—of former presidents getting armed guards once out of office. I can’t be assured that other presidents didn’t have it informally, because who would know? But Lincoln offered [security]. Buchanan was afraid. He wanted to live the life of a squire at the end of his life and he wasn’t able to. He was looked upon as a failure pretty quickly. Mr. Irrelevant 2018: Trey Quinn—Trey Quinn became Mr. Irrelevant 2018 when he was selected No. 256 overall in the NFL draft, making the leap from SMU to the Washington Redskins. 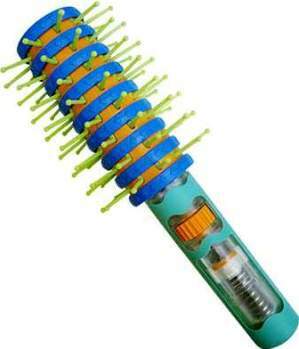 Orbit Brush—A reinvention of the traditional hair brush. 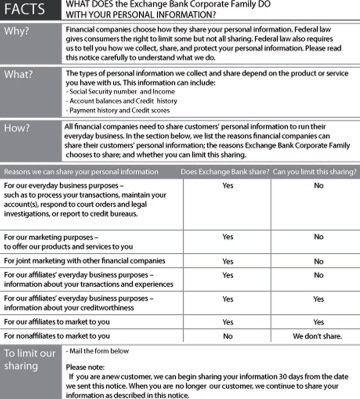 YSK: How Financial Companies Share Your Personal Info—Banks, credit card companies, and other financial institutions can share your personal information—even after you are no longer a customer. 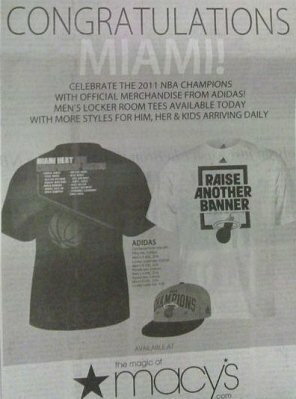 Macy’s-Miami Herald-Miami Heat ad fail a deliberate mistake?—Monday’s Miami Herald featured a three-quarter page ad congratulating the Miami Heat on winning the NBA championship.